It’s Halloween Night, and 17-year old Dora Vogel is looking forward to a night of partying with her boyfriend, Jace. The night has other plans for her, starting with her doctor’s diagnosis that she’s four weeks pregnant. From there, things only get worse as her house is visited by an unsettling gaggle of trick-or-treaters, who have less than benevolent plans for her and her unborn child… plans that require blood. Under siege, with her pregnancy moving along at an accelerated pace, Dora is soon pulled into an alternate plane in a fight for survival against the pint-sized invaders. This Halloween is going to be one hell of a night. 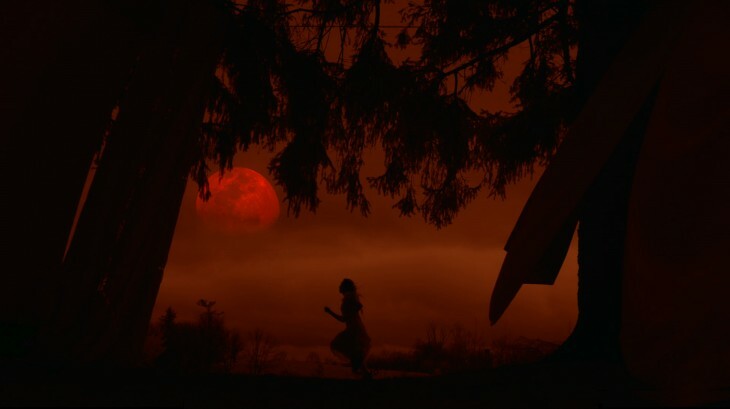 HELLIONS , Bruce McDonald’s second foray into horror (following the universally-acclaimed PONTYPOOL) is a very much a beast of a different stripe. While initially a by-the-numbers “alone in the house” slasher story (with an army of costumed demon-kids as the monster of choice here), the film abruptly changes gears and slides into a more surreal, dream-like state. The visuals become more hallucinatory, the narrative disjointed and abstract. The feeling is akin to watching a Stephen King movie, than changing channels to a Lucio Fulci film. The effect is jarring, but effective. The film is shot beautifully, with Dora’s shift into the “other side” rendered in a bleached colour palette that creates an unsettling, otherworldly feel. While the film trucks with the standard proto-Halloween imagery and symbolism (most notably, an ominous looking pumpkin patch where the “Hellions” gather), it all has an ominous tone, saturated with dark oranges and brown and tinged with rot. The trick-or-treaters, all decked out in grimy and distorted “old-timey” Halloween costumes, are an unsettling mix of nostalgia and nightmare. It’s Ray Bradbury’s rose-coloured recollections of the autumnal “October Country”, reimagined by Hieronymous Bosch and filtered through the minds of madmen. It’s wonderfully unsettling stuff. As far as the cast, the bulk of the heavy work rests on newcomer Chloe Rose’s shoulders. A lot of advance word on Rose’s performance as Dora has come out of HELLIONS’ multiple festival screenings, and with good reason. Rose’s performance is solid, conveying Dora’s terror of her inter-dimensional peril, as well as her impending motherhood, with conviction and palpability. Even as the film’s narrative goes deliriously off the rails, she anchors things with her believable and sympathetic performance, thus earning all those “one to watch out for” kudos. Genre vet, Robert Patrick, delivers great work in his small role as the sheriff who gets pulled into Dora’s nightmare, bringing down-home gravitas to the proceedings and proving he’s still one of the best character actors working today. The film’s narrative, much like the filmography of the above-mentioned Fulci, defies any concise logic or common sense. By the three-quarter point, it fully embraces its nightmare sensibilities, leaving the “whats” and “whys” open to personal interpretation. Has Dora been pulled into Limbo by her unwanted visitors? Is this all happening in her mind? Is it a symbolic fever dream brought on by her impending parental anxieties? Who can say? McDonald and screenwriter Pascal Trottier aren’t interested in spoon-feeding the audience, and that’s actually refreshing. Horror and allegory have long gone hand in hand, so there’s much to appreciate in a film that encourages you to interpret what you just saw. HELLIONS is a pretty bold experiment, one that goes way beyond what its promotional campaign would lead you to believe. It’s not going to be everyone’s cup of tea – the abstract visuals and plot will probably lose, even irk, some viewers along the way. If you’re willing to let go of preconceptions and go along with its dream-like flow, you’ll be rewarded with a nightmarish little trip. HELLIONS has both tricks and treats in its little bag, if you’re brave enough to open the door when it comes knocking. HELLIONS is now available for viewing on VOD, as well as in limited theatrical release, through IFC Midnight.